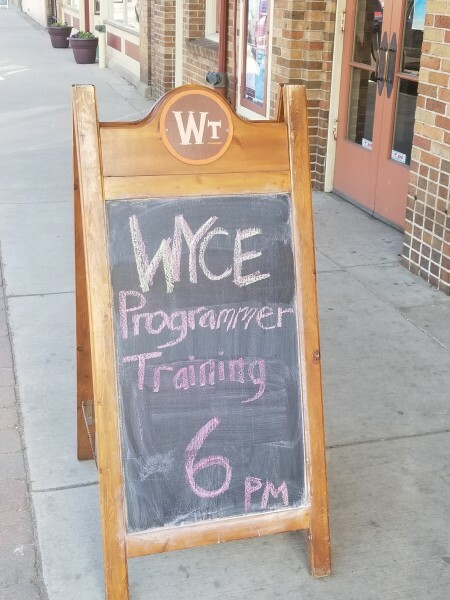 I am welcomed into the 2018 WYCE Programmer Training. And while the road to 'on-air programmer' may have its share of challenges, I gathered the courage to battle the butterflies, thanks to an unexpected source. I read the email. And I read it again. I must have gone over it at least a dozen times since it was sent. I know what it says… it just still feels like a dream. I know and appreciate that for some people reading this message, it is the beginning of a great adventure into the local community, and into the West Michigan music scene. But for me, I am already a part of both. In several ways and for a variety of reasons – and thanks to countless supporters along the way – I have been welcomed into the West Michigan music community for the last three years. I have already been shown an amazing, supportive, welcoming community of music, performers, and fans West Michigan has to offer. I already know that every artist, every musical group, and even every fan has a story worth sharing – worth hearing and enjoying. But I consider it an honor and a privilege to help share that with all of you. And words can barely express how thrilled I am to begin down this path to becoming a programmer at WYCE, and to be granted this unique gift – this rare opportunity – to help spread the word about how amazing this local music scene really is. However, I realize, that this is an intimidating thing – to speak, share my interests and, in a way, open myself up to a city full of listeners, and beyond… but the funny thing about that is, I am inspired even more than when I began. I am inspired by someone who has no idea what is happening with WYCE, or the local music scene – but she believes in me. The night I got home from the information session, with so many interested people – a theater full of hopefuls, ready to take their first steps toward becoming a full-blown WYCE programmer, sitting in the big chair with their own show – I was a little nervous. Would they pick me? Would they pass on my application? There were so many people there… what if I don’t make the cut, or if I don’t have what it takes as much as I thought? What if, with my other jobs and obligations, it was just too much, and I couldn’t do it? I had so many worries flying around my brain that I had to consciously shut them off when I came back home to take my place in our three-person family evening hug – between myself, my wife, Rachel, and our three-year-old daughter, Riley. After the hug, I lay down next to Riley as she started to drift off to sleep, as per our evening family ritual. Before she drifted off, Riley told me about how her doll was scared of something earlier today, but now she was being brave – not afraid anymore. I froze, even as she nodded and took this in (as much as a three-year-old can, anyway). But I took it in, myself – more deeply than she ever would understand, she had inspired me right back. I knew what I had to do. I will come at this training program, and all the dedication that needs to come along with it. But not only that, I will dedicate this new WYCE adventure to my little girl, Riley: may she always have the courage to reach for anything her heart desires, regardless of fear. So I look forward to sharing this WYCE Programmer Training adventure with you all as we progress through the sessions. Thanks in advance to all Rapidian readers who follow with me and my fellow trainees on our road to "On-air WYCE Programmer." And above all else: Thanks, Riley… this one’s for you.